This design utilizes the Silhouette's print & cut feature. For more information about print & cut designs, please visit silhouetteamerica.com. 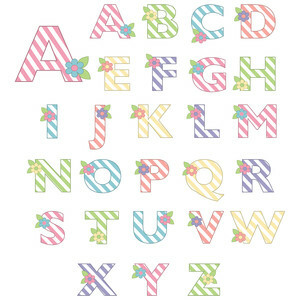 Pastel, striped alphabet on a print and cut planner sticker sheet. Each element can be cut and printed individually. They can be used on window clings, tags, cards, charts, planners, stamps, scrapbooking, labels - wherever you can put a sticker or label! They can be re-sized without affecting the quality. The entire collection can be viewed at: http://www.scribbles.graphics/stripes-polka-dots/.